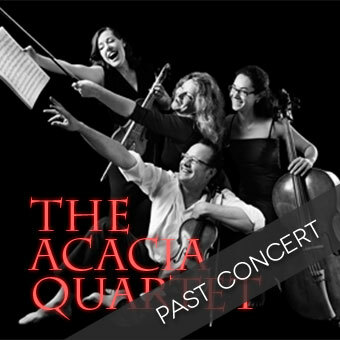 The Acacia Quartet is comprised of four remarkable musicians: Lisa Stewart and Myee Clohessy (violins), Stefan Duwe (viola) and Anna Martin-Scrase (cello). Their diverse careers led them to play in chamber ensembles and orchestras the world over before forming the Acacia Quartet in 2010. Their performances couple established repertoire with the unorthodox and have notably included debut performances of contemporary compositions. In the short time the group has been together, they have collaborated with acclaimed soprano Jane Sheldon, bassoonist Kim Walker, singer songwriter Katie Noonan, vocal ensemble Halcyon and composers Elena Kats-Chernin, Gordon Kerry and Lyle Chan. The Acacia Quartet developed a special relationship with Elena Kats-Chernin when she heard them play her music in 2011. Kats-Chernin’s invitation to record her complete work for string quartet resulted in the world-premiere recording made in the presence of the composer. Two recordings have been released so far by the Acacia Quartet: ‘Blue Silence’, the double CD with the complete string quartets by Elena Kats-Chernin and ‘North + South’, 10 folk songs with Jane Sheldon and Genevieve Lang. ‘Fast Blue Village’, the first volume of ‘Blue Silence’ received a 4 ½ star review and Editor’s Choice selection in the July 2012 edition of Limelight Magazine and ‘Blue Silence’ was just featured as ABC Classic FM’s CD Of The Week in February 2013.